Perfect for albums, collages, scrapbooks, flyers and posters. Why do I need printing software for my digital images? Pics Print allows you to batch print all of the images in a folder, camera or selection at once. Wizards allow you to quickly and easily perform common printing tasks, such as creating posters, album-sized prints, greeting cards and thumbnail sheets. 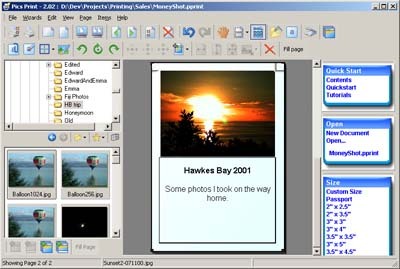 With Pics Print your print-out is displayed on-screen exactly as it will appear on paper. You have complete control over the size and layout of your images. Moving and resizing your images couldn't be easier, just click and drag. Or right click and choose from predefined layouts and sizes. You can also add comments and filenames to them. Pics Print creates images at the highest quality your printer can manage. 1 July 2013 Windows 8.1 compatibility confirmed. 10 Jan 2013 Windows 8 compatibility confirmed. 24 Sept 2010 Rental Property Manager 2.28 released. See changes here. 24 Sept 2010 Pics Print 3.26 released. See changes here. 13 Feb 2010 Rental Property Manager 2.24 released. See changes here.